Did a 1980’s comedy about a group of social misfits help pave the way for today’s societal push for tolerance and inclusion? 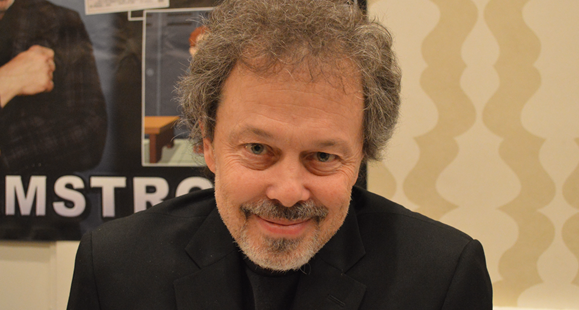 Curtis Armstrong believes that it did, and he may have the weight of history on his side. Armstrong — the nose-picking oddball from the film Revenge of the Nerds — is in Baltimore this weekend, making an appearance at Monster-Mania-Con. 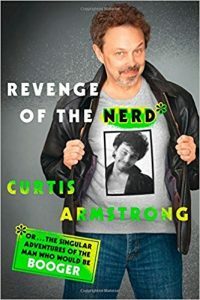 We caught up with “Booger” at the horror convention to talk about his new book, “Revenge of the Nerd: Or… The Singular Adventure Of The Man Who Would Be Booger.” Revenge of the Nerd is available at Barns & Noble. BPE: Please tell us about the book. Curtis: Well, it’s a memoir which deals with a nerds world, a nerds progress. I was born in Detroit in the ‘50s as a nerd, although we didn’t have that expression back then, and lived my whole life as a nerd. Ultimately, I became well known for playing a nerd. Now, after all of these years, nerd culture, which was very confined and restricted to comic book sales and church basements, has become what it is today. I wound up in the middle of this. After a while, I decided to write a memoir which didn’t just deal with the movies and the TV shows. I wanted to write a book about what it was like growing up as a nerd in a non-nerd world and then watching as that world basically shifts. BPE: It seems that today, given the explosion in the computer industry and our comic book culture, that it’s actually cool to be a nerd. Curtis: Well, it’s something that as a nerd I was watching happen in real time around the release of Revenge of the Nerds in 1984. It wasn’t because of Revenge of the Nerds, but something was definitely happening. The fan conventions were becoming much larger and inclusive. There were different fandoms who started to find each other on the internet. Horror movies and teen comedies were starting to get frequent play on television, and on home video, which was something new. As a result of that, I think the acceptance just grew. Movies like Revenge of the Nerds were films that made people realize the value of inclusion. 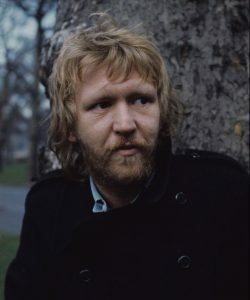 And those who always felt left out realized that there was a community out there and it was bigger than they ever knew. It happened to me in a way which I was thinking about recently. This was maybe 1998? Since then, it just goes on and on. The fandoms get bigger and more committed and there is more bleed-over from one group to another. All of this is very encouraging to me. It’s not only healthy but it’s tolerant. There’s a dark side to everything, and I talk about that too in my book. But in nerd culture, it’s overwhelmingly positive, and I love that. 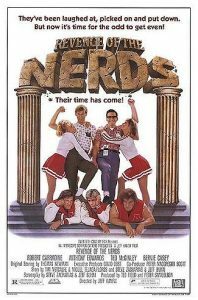 BPE: When I first saw Revenge of the Nerds, I remember laughing out loud and repeatedly saying to my date, “What a nerd! What a Nerd!” But the laughter, and our outbursts, came with a great deal of affection. Curtis: Robert Carradine and I wound up years later producing a show called King of the Nerds. It was a comedy/reality show that lightly mocked reality shows. If anything ever started getting even slightly mean-spirited in the edit, I would say, “Let’s go back to Revenge of the Nerds and look at that last scene at the pep rally. That’s what we’re looking for.” Those guys who come down and say, “We’re nerds, and we’re proud of it. And everybody here, whatever they’ve called you, you are welcome to join us.” That to me is the most valuable thing about that movie – the message. To me, that message is the thing I cling onto. In the three seasons that we did King of the Nerds, that’s what we always went back to. The tolerance, the inclusion; the support and the love is always going to be a positive thing.